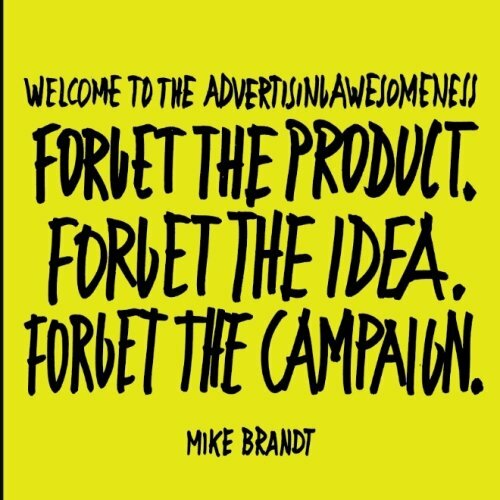 Mike Brandt Welcome To The Advertisingawesomeness: Forget the product. Forget the idea. Forget the campaign. Welcome To The Advertisingawesomeness: Forget the product. Forget the idea. Forget the campaign. A hands-on marketing book for today's changed world. The book describes five steps (of awesomeness) going from looking at your brand from people's perspective to reaching a marketing solution that works. Actually it's less a book than a workshop as it is the result of digital thinking workshops – therefore tools and methods are explained followed by a step by step guide how to apply it, encouraging the reader to put it into action straight away. Be prepared to be challenged in your way of marketing and business. Founder of the firm urge (hiurge.com) where Mike co-creates with businesses and brands applying the tools and methods from his book. He as well facilitates workshops at ad agencies around a digital approach. Mike taught in Internet-related subjects, like Multimedia Design and E-Marketing – in E-Commerce and Digital Project Management on Bachelor level. He started out as Art Director at advertising agencies Jung von Matt, Springer & Jacoby, and Heimat. He lives with his family in Copenhagen and enjoys the Scandinavian way. 1. Welcome To The Advertisingawesomeness: Forget the product. Forget the idea. Forget the campaign.